Each and every day, managers are faced with issues related to keeping their employees safe. It may be obvious that certain plant employees or construction workers need helmets or laboratory technician needs safety goggles. This protective equipment is provided for the safety hazards that we can see. What about protecting your employees from the very air they are breathing? Certain manufacturing and/or production processes can create harmful gases, as can different lab experiments among many other scenarios that employees find themselves in during the course of their work. 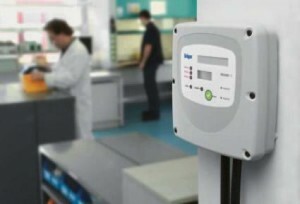 Basic gas monitors can provide precise, low cost, low level monitoring of a variety of gases such as hydrocarbons, solvents, alcohols, and toxic gases. One of the most common gases that facilities need to monitor is carbon monoxide. Some of the more common areas that need monitoring include: parking garages, tunnels, repair garages and furnace rooms. CO monitors can be used for sampling in facilities such as: refineries, petrol-chemical, steel mills, water and wastewater, mining, pharmaceuticals, chemical, brewing, and food processing. While CO may be one of the most common gases that facilities measure, there is growing awareness of other poisonous and combustible gases. The need to constantly measure the gases in the environment demonstrates a need for a gas detector or gas detection system. When dealing with any of the above hazards, managers may be unclear of the proper equipment needed to provide protection. The professionals at Reliable Fire & Security will perform an onsite survey allowing them to assess each of the risks facing your employees and determine the detectors or detection system that is right for you. At Reliable, we utilize state of the art sensor technology in order to provide our customers with an accurate detection of toxic gases, combustibles and oxygen hazards. A sudden drop in oxygen could create an extremely dangerous environment for employees, one in which they may not be able to react or respond. The most common areas in need of an oxygen gas monitor are: laboratories, MRI rooms, semiconductor facilities, pharmaceutical plants, and cryogenic suppliers. The professionals at Reliable Fire & Security have the industry knowledge and experience with a variety of systems and can perform inspections as needed. If you are already utilizing a system, they are able to determine if an upgrade is needed. Perhaps, in an effort to improve quality, you are using a higher temperature as part of your process or you have altered the process in some other way. Have you determined if the gases produced during the entire process remained the same with the same concentration levels? This is when you need a professional survey completed to determine if your detection needs have also changed. Many of the gas detectors used today are battery operated and send out a warning signal through a combination of audible and visible signals including alarms and flashing lights when unsafe levels of various gas vapors are detected, depending on the type of gas that the detector is designed to monitor. The monitor measures a gas concentration by using a sensor that compares the sample to the calibration gas that is used as a reference point. If the sensor measures an amount of gas that exceeds the calibrated acceptable amount, an alarm will be signaled. Many detectors are able to sense a variety of toxic or combustible gases or a combination of both, depending upon the need of the facility. 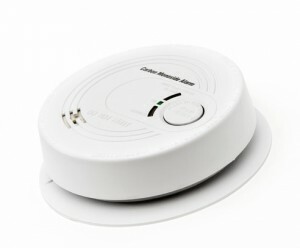 As noted above, there are a variety of types of gas detectors. This is the reason it is recommended to have the professionals at Reliable Fire & Security perform a site survey in order to determine the exact type of detector you need. The detectors are generally classified by their operating mechanism. Each technology has its own unique features with respective detection range and application. Portable Devices are used to monitor the environment around employees and is worn on clothing or on a belt/harness. Fixed gas detectors may be used for detection of one or more gas types and are usually mounted near the area where certain processes are occurring or in a control room. They are often installed on fixed type mild steel structure with a cable connecting the detector to a Supervisory Control and Data Acquisition (SCADA) system that allows constant monitoring. A fixed device is for permanent and continuous analysis, typically used in large industries where continuous monitoring is the prime factor. Portable devices are used for occasional analysis. Using personal gas detection monitors or having a system installed is only the beginning of the process. All gas detectors must be calibrated in order to ensure that they function as intended. Portable detectors are typically calibrated on a more frequent schedule because they are exposed to constant change in the environment in which they are used. Fixed detectors follow a different schedule depending upon the environment in which they are utilized. They may be calibrated quarterly, bi-annually or annually. The professionals at Reliable Fire & Security are available to assess and recommend the appropriate monitor for your facility.